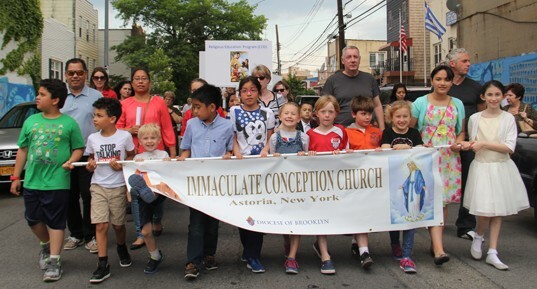 Fresh off another campaign, Immaculate Conception Church in Astoria, jumped right into the Generations of Faith campaign with the rest of the Diocese of Brooklyn and have so far met 65 percent of their Generations goal of $730,000! Parishioners of Immaculate Conception, Astoria, participate in a Year of Mercy procession to the Holy Doors at Our Lady of Mount Carmel Church. “We just completed a campaign where we raised $1 million to repair our church’s tower, which is now in pristine condition,” Msgr. Fernando Ferrarese explained. “We’ve experienced a bit of fatigue after just completing one campaign and moving right into the next, but I think our case is strong enough that people want to help bridge the gap. With the help of its pledge collections, the next important project is the replacement of the Spanish tiles on the roof of the church, which has not been worked on since 1951. The tiles will be secured to prevent them from falling, and the roof renovation will include water proofing in order to prevent possible water damage. Due to the diverse cultures at Immaculate Conception, another part of its case elements includes purchasing video equipment so that Masses, weddings and funerals can be recorded. The parish has many attendees and families who live and travel across the world and are not always available to see certain events.